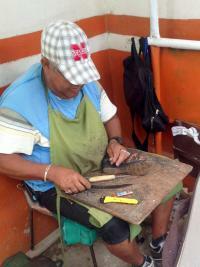 This man has a small stall in town fixing shoes. 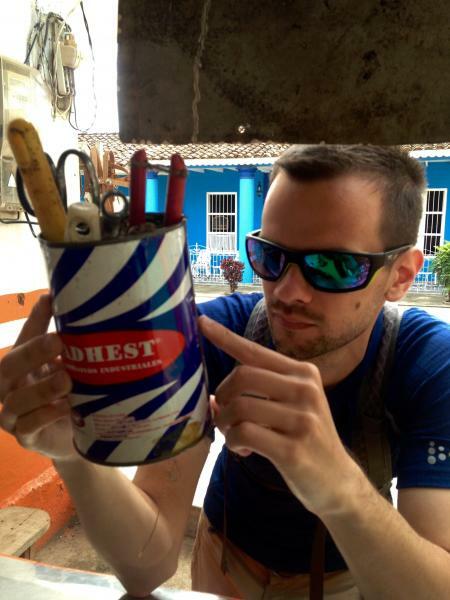 Cubans are master recyclers, perhaps to a fault. Your used water bottle may be re-purposed into a drink mix bottle and resold to a thirsty beekeeper, who may use it to store and sell his honey. After that, it might be used to store gasoline and then left on the side of the road for someone to pick up and reuse again, or perhaps to be recycled (Yes, we did see water bottles used for all of these things.) Most stores have used items, from books to clothes to shoes, and the culture of repairing things rather than throwing them away is very strong. By the way, this man had no idea what huskers meant, where Nebraska was, or that it was even a place. Anything with English on it is in style… no matter what it says. Josh and the shoe repair man bonded over adhesives.